Schedule now to reserve the best time for your needs. We are now taking reservations for this spring and summer. A quick, affordable solution for high quality road paving. Keep your crops and property free from unwanted dust. Protect your vehicles and stabilize your road surfaces. Roadtek got our large chip sealing job done on time and under budget. The workmanship was great and the entire crew was friendly and professional. Would definitely recommend! Roadtek is one of the Northwest's largest licensed, bonded and insured dust control providers. We feature quality dust control products and services at competitive prices. Specializing in commercial and industrial applications in Washington, Oregon and Idaho, Roadtek, Inc. is a leader in providing professional road services! What Separates Us From Other Dealers? What truly distinguishes us from other dealers is that we offer both road repairs and road improvements guaranteed to improve the quality of your road throughout the summer and winter. Resolving maintenance problems before applying dust control or chip sealing leads to a better return on your investment! Roadtek, Inc. - Offering Excellent Pricing and Customer Service! Don't Wait, Our Schedule is Filling Fast! We encourage our customers to contact us now get a free estimate for next year's road repair season. Roadtek is a leading road repair, dust control and chip sealing provider for commercial, industrial, and residential road construction in Cle Elum WA and Seattle area. Call today for a free estimate 866-387-8668. 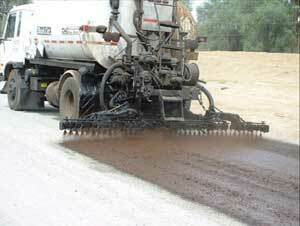 We provide quality dust control products and services, as well as road repairs and chip sealing services. © 1997 - 2019. Roadteck Inc. All Rights Reserved.